Legendary record shop that occupied a number of locations and run by the a larger than life Danny. My first recollections of Reddingtons was when it was in Moor St, at the back of what now is the Pavillions and by the subways that led to Moor St Station and more importantly The Outrigger/Ship Ashore. I used to rummage through all the boxes outside and remember picking up some great vinyl treasures which I still have today. Every Saturday me and my cousins would head there. It then moved to Cannon St, off Cherry St by Rackhams which occupied 3 floors if I remember correctly. I was never so taken with this shop, it seemed to organised! 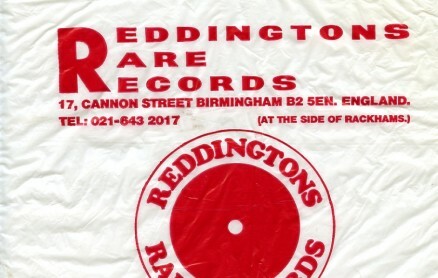 From here Reddingtons went back to Digbeth High St where it didn’t last so long and now I think it just operates online. 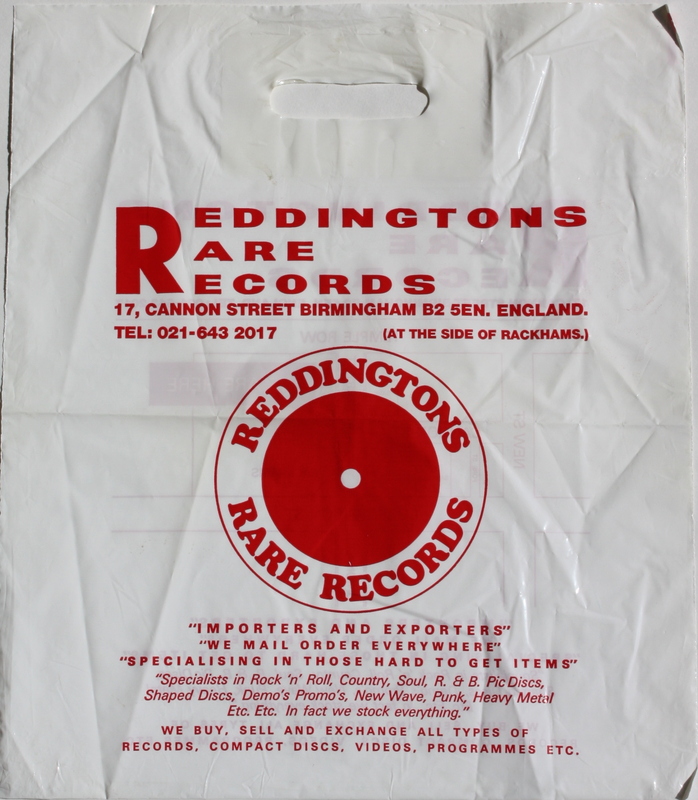 Nigel King has sent a couple of photos of the classic Reddington Rare Records carrier bags. I love this. 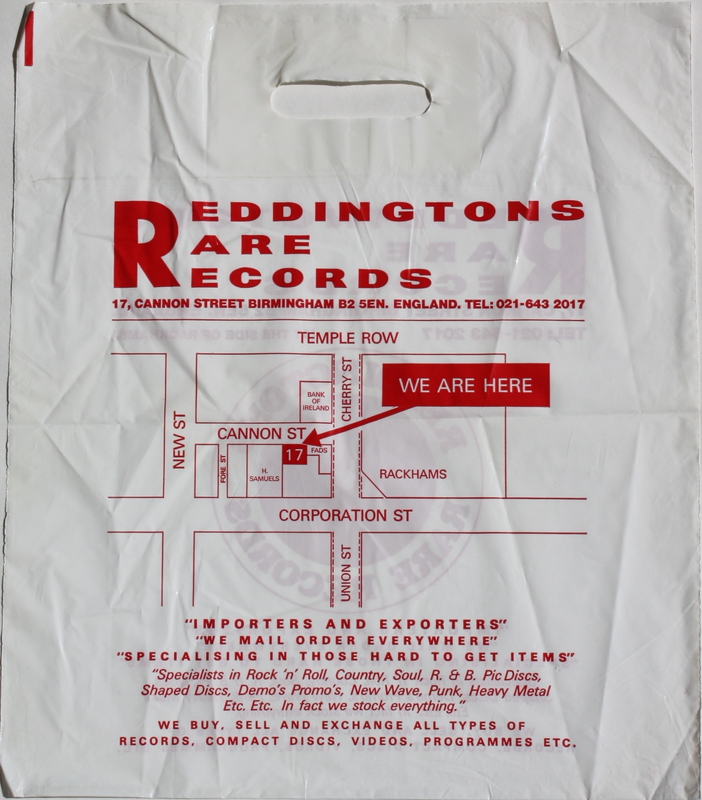 Nigel has a load of great photos of all manner of record shop carrier bags. 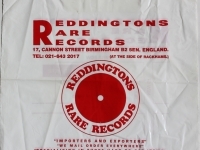 Used to hang out at Reddingtons Rare Records a lot on Saturdays in mid 70’s to early 80’s, and also the poster shop next door. Got to know Danny Reddington and he asked me to watch his stock he had in boxes on the pavement outside the shop and would let me choose a couple of lps when I went home. Danny had 4 shops at Moor Street and Quartz used to use one of them as an office where Mal Cope worked sorting out gigs and tours etc and also used shop as as a studio/practice room for try outs for new singer and bass player when Taffy and Dek left. Taffy and Mick worked in the shop for a while as did Bobby Cool (Lights Engineer). Danny moved to Cherry Street Colmore Row when the Moor Street area was developed and then moved again to Smithsfield House in Digbeth before the lease ran out and is now completely doing on-line trading and sales. When QUARYZ were popular in 80’s with the explosion of NWOBHM v Danny set up his own record label and put out several releases mostly with QUARTZZbut also with a release from Nottingham band called PARALEX (highly sort after rare release) and a commercial pop outfit called MAYDAY. Trying to track down Barry who had the record shop downstairs in oasis market. Anyone remember around 85 at wknds would hang out at the Barrel Organ digbeth then downstairs at Steptoes. Or paul from the origional virgin records. 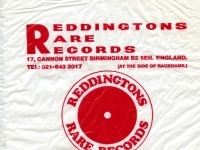 I worked in reddingtons..on saturdays…and RCA record company west brom during the week..brilliant place to work..Danny was great..knew his stuff..loved it cos was (and still am) into northern soul…and all soul really..bought some absolute gems from there..and also from my mates record shop in Oasis..called ‘soul galore’owened by Steve Glover..best timer of my life..niters and alldayers..the best of everything..perfect way to start my weekend workin there! i worked at RCA records with julie and worked saturdays at Virgin records. great times spending all my money on records and working at virgin to get paid in albums. glad to say that vinyl is making a come back and still spending money adding to LP collection. Hi Julie! I just came across your post and had to reply. Not sure if you remember me – Laurie Smith [I was one of the ‘Soul Twins’ – Iain & Laurie – from Halesowen]. Was into Norther Souls bigtime – and used to DJ a lot around the Birmingham area. 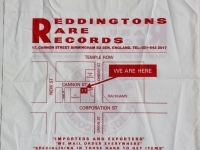 I was a regular at Reddington Records and also at Steve Glover’s shop in Oasis market. Fantastic guy Steve – so sad to learn he had passed on as I spent many an hour chatting and fooling around at his shop. Like you I left the UK a long time ago  and have lived in Hong Kong for over 20+ years. Would be lovely to hear from you – drop me a line at [email protected] if you get this! All the best Julie and KTF! I’ve had a few flashbacks about Saturday trips into Brum record shopping in the 1970’s. I remember buying Steve Harley’s Hobo With A Grin at Reddington’s on Moor Street Queensway. I just have a memory of going down a ramp and a few shops underneath something. Maybe someone can help me remember this. In same row of shops I used to buy David Bowie posters and badges. It was a shop on end. A bit further along from Reddingtons. Anyone remember the poster shop? I bought loads of rare records from this store as I was Deejaying under the name of “Haggis” in and around the Bromsgrove area. Well before it was known as Northern Soul….Brilliant…. 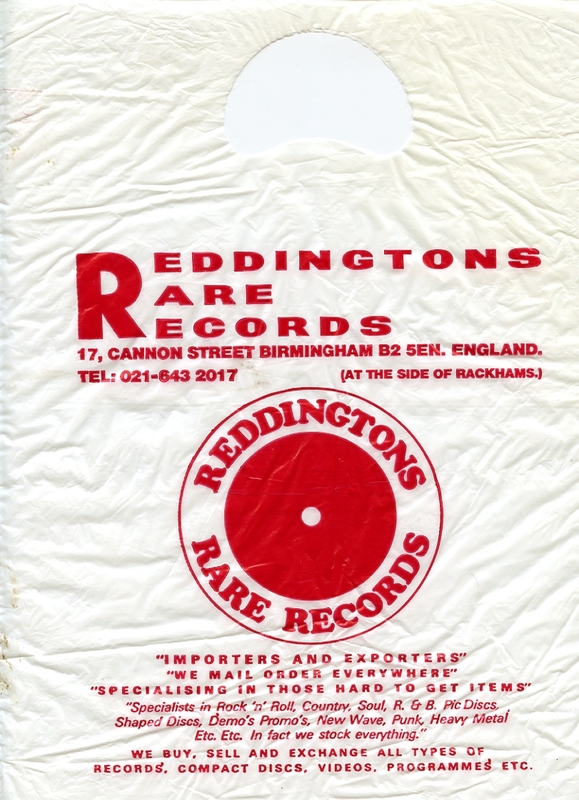 Used to pop into Reddingtons every now and again in the early 80’s, not so much for the records but more to peruse the extensive badge selections. Back in the halcyon days of heavy metal, the denim jacket / waistcoat was very much the apparel of choice so a well placed badge or two from Reddingtons was always added amongst the patches. On the Quartz theme, me and my pals were at the live gig at Digbeth Civic that was recorded for their live album (fairly sure that was on the RRR label). Does anyone remember a tall irish guyin Oasis in the mid 70s called Gerry (Gerard) Weldon. Think he may have sold jewellery? I used to hang out in RRR from around late 80s into early 90’s…Bought a hell of a lot of records. I would spend Sat afternoons downstairs chatting with Paul + Bob, scouring the place for metal….They knew their stuff….I can feel the excitement now that I felt then, on th efast approach to the shop, me and my friends would literally race – just to be first in, to get that rarity – as we all loved the same stuff. I remember Danny holding the occasional half price sales on a Saturday too, all my paper round money would go on LPs……(Save a cpl of quid for fags). The patches and badges were cool too. Paul was always cool to let me leave small deposits on rare / expensive items + pay weekly etc………. I shall never forget one Saturday morning hearing “Another Brick in the wall part 2” on the radio. I immediately got the bus to Reddingtons and asked for it. “You do know they haven’t released a single in 14 years don’t you” was the reply. I took that as a “get lost, twit” and went to Lewis’s and got it straight away, no fuss. To this day I wish I had gone back to Reddingtons and waved it in their faces. Still, they fed my vinyl addiction but could be a bit pricey. When in Moore Street there was a good poster, badge and memorabilia shop next door. I spent a vast majority of my youth buying from Reddingtons and hanging around the Moor St shops, we used to call the alternative bookshop next door:”the hippy shop” and then the poster shop on the other side which was run by two guys, one of whom used to contribute gig listings to a local music paper, the name of which escapes me. My first ever purchase from Reddingtons was a Joe Walsh album “The Smoker You Drink The Player You Get” on vinyl which I still have to this very day. Saturday mornings would kick off at Bogarts on New St then over the road to Woolworths restaurant to try and sober up with a coffee then down to Reddingtons to spend the last of my hard earned on as much vinyl as I could afford. I later became a dj by accident under the moniker of “Cosmic Fish” , oh dear, we had fun though, crazy times. Sadly, most of my associates/friends from that era are now dead.